This superb necklace was sold October 8, 2014 at Sotheby's Art of Imperial India auction. Alexandra Roy, the specialist in the Middle East department, Sotheby’s London, notes that this necklace is, "[an] example of luxurious simplicity." 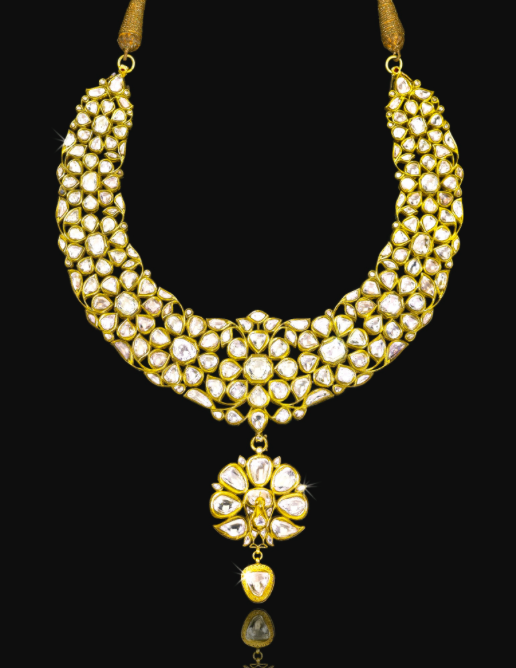 It is an "important diamond-set and enamelled gold parade necklace (khanti)" from North India, dating to circa 1850-75. Exhibited at the Natural History Museum in London during their exhibition Diamonds: The World’s Most Dazzling Exhibition in 2006, this piece is striking for its comprehensively diamond-studded surface which contrasts with its rich, polychrome enamelled design of floral petals on the reverse."